Kevin O'Brien gave his wicket away with a rash shot at the start of Day 5. Ireland lost their maiden Test match by five wickets to a game Pakistan side, but the visitors didn’t have things all their own way. After the first ball mix-up which left debutant Imam-ul-Haq temporarily floored after colliding with keeper Niall O’Brien, the Irish bowlers kept the pressure on the Pakistan batsmen, reducing them to 13-2 and 159-6, before a century stand by Shadab Khan and Faheem Ashraf took Pakistan to a position of relative security that enabled them to declare on 310-9. In response, Ireland were reeling at 5-3 at lunch on day three, before recovering slightly to reach 36-5. Defiant middle- and lower-order batting enabled them to regain a tiny measure of pride with a first innings score of 130, which saw Pakistan inviting them to follow on 180 runs behind. Facing the humiliation of an innings defeat, the Irish openers fought hard to take their score to 69 without loss before another string of errors and bad luck saw them stumble to 95-4 and then 127-5. It was left to Kevin O’Brien (who top-scored for Ireland with 40 in the first innings) to rally the lower order to push his way through to the highest score of the match and, in doing so, setting Pakistan a tricky target of 160 for the win. O’Brien’s 118 was the first Irish Test century, and he joined just three other batsmen who have scored a century on Test debut in their country’s first Test match. Although they ended up losing by five wickets, Ireland made a competitive fight of it in the end, getting themselves into a position from which they might conceivably have pulled off a victory which would have made them only the second team after Australia to win their maiden Test match. Testimony to their fighting spirit was the fact that they clawed their way back from following on to give themselves a chance to become only the fourth team in the history of Test cricket to win after being forced to follow-on. Ireland bowled with fire to knock three Pakistan batsmen over for 14 runs, causing South African-born coach Mickey Arthur to drop his head as he watched his charges from the sidelines. Pakistan showed their experience with a fourth-wicket stand of 126 that seemed to have taken the match away from Ireland, but the hosts refused to give up without a fight and made the Pakistanis work hard for every run, snatching two more wickets to keep the Pakistan team on edge until they had secured the win. In the end, it was a reasonably comfortable win for Pakistan, but the Irish bowlers couldn’t be faulted for their tactics or application in the second innings. Aside from the Irish debutants (notably O’Brien’s 118), it was a match dominated by Pakistan’s debutants, as lower-order batsman Ashraf top-scored for the visitors with 83 in the first innings, followed by fellow debutant Imam, with an undefeated 74 in the second innings. The Irish bowlers all showed quality, with Tim Murtagh the pick of the bowling, taking 4-45 and 2-55. Their fielding was generally strong, with Paul Stirling showing himself to be a solid slipper, although keeper Niall O’Brien was far from convincing behind the stumps (or in front of them! ), he has the quality to step up to the plate in future Tests. Eight of the 20 Irish innings lasted for 96 balls or longer, proving their ability to dig in and play serious Test innings, although their four ducks would have been a source of great frustration for their batsmen. 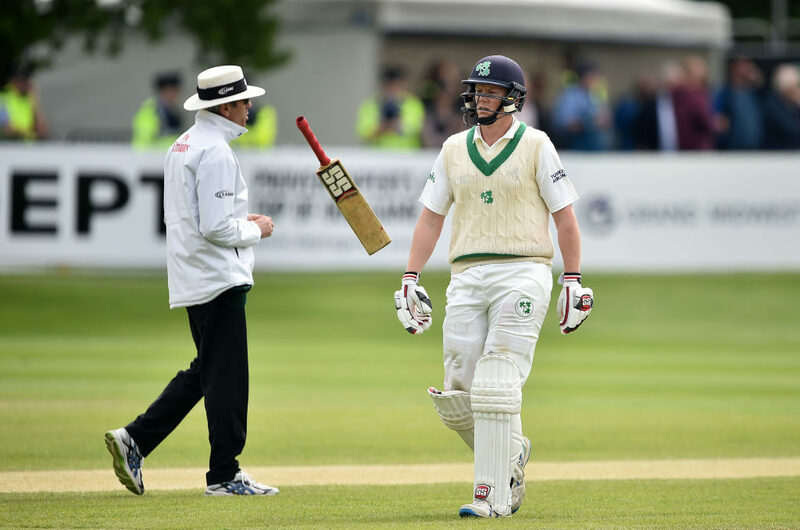 Ireland recorded their first century partnerships in the second innings as Kevin O’Brien and Stuart Thompson added 114 for the seventh wicket, followed by a 50-run partnership between O’Brien and Tyrone Kane. Ireland also recorded the highest score of the match (339), although it was left to Imam (almost run out off the first ball of the Test) to end the match by hitting the winning runs. ‘The 200 mark would have made it close, but full credit to the boys. If we’d been able to break that partnership earlier, it could have been close. We had a hell of a lot of good things coming out of the game. 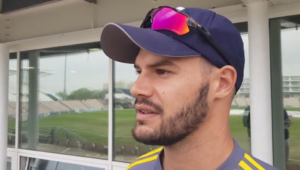 I couldn’t have asked any more of the bowlers, we’d have liked to have the opportunity to bat that first innings again, but we showed character, and brought that into our first Test. Regardless of what happens, we always talked about winning the next session,’ said Ireland captain Will Porterfield after the match. Ireland should feel buoyed by their first foray into Test cricket, and future opponents will be looking at them as being far from pushovers. Sadly, though, as things stand, the Irish men’s team are currently in last place in the ICC Test rankings as well as in the ODI rankings… and they are second-last in the ICC Twenty20 Championship, just ahead of Nepal! Although the Irish women’s team are undefeated in Test cricket (1 win from 1 match, against the Pakistan women! ), they are also currently in last spot on the ICC Women’s Championship. Clearly, the only way is up for Irish cricket.